On April 11th, 2012, at 1:32 pm local time [Wisdom Quarterly’s spiritual hero] Buddha Boy (aka Ram Bahadur Bomjon, now Maha Sambodhi Dharmasangha guru-jii, formerly Tapaswi Palden Dorje) took wholesome food and water offered by his assistant monk named Buddha. Why do we revere a guru? According to many Buddhists, particularly Mahayanists, the purpose of this life is to help others. This is more pronounced in a subdivision of Mahayana known as Vajrayana. Bodhisattvas and Vajrasattvas help free all sentient beings from the suffering they experience and to lead them all to peerless enlightenment, a state beyond sorrow. But in order help sentient beings, first we ourselves must reach enlightenment (becoming at least stream enterers). In order to do that, we need the twin tools of compassion and wisdom. the best teachers are those accomplished in these qualities. There is an ancient Indian devotional practice called guru puja (“worship” or devotedness) to connect with such the guru (teacher) and thank him/her for teachings given. Northern California’s LOMB performs such rituals. And at the end of June 2012, the “Relics Tour” comes to LOMB. (March 21) Having followed the path of the true Dharma in search of purest path, I am giving the timeless message at the world Peace Maitri Puja (Loving-Kindness Devotional). It lovingly benefits all Dharma-loving followers striving for the liberation of all sentient beings from suffering and pain. This takes the form of the Guru-Marga (Path of following a Teacher). 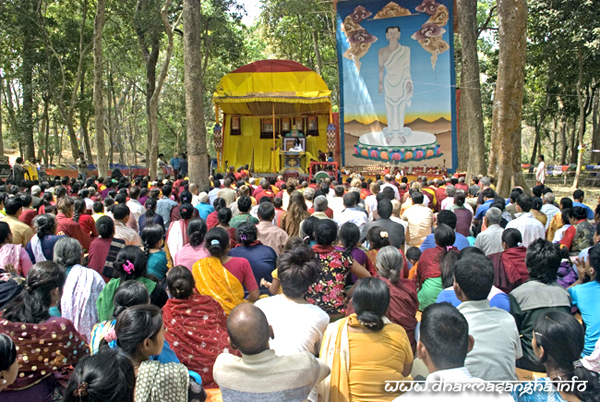 The Bodhi Shravan Dharma Sangha (Enlightened Wanderer Liberating-Truth Community), which was established having arrived on Earth 35,000 years ago according to the Maitri Calender. Just as a flower without obstruction freely offers its beauty and fragrance to the entire universe, so should humans eliminate from their lives attachment (clinging), anger, greediness, craving for sensual desires, pride, wrath, violence, killing (motivated by aversion or fear), and other defilements. For unless one cultivates the true Dharma’s precepts, the fragrant flower cannot blossom. These things are obstructions, obstacles, hindrances. July 6, 2018 in DIVINE PRESENCE: Our Galactic Connection, The Way of the Rainbow Warrior.